Well I went ahead and splurged and paid the $5.95 to get my credit score with my free credit reports and my score currently is an 861. I believe that’s pretty good, although its not as high as it could be (scores range from 400-925). I have nothing negative on any of my credit reports and well there shouldn’t be. I’m guessing my credit score is hurt by lack of history seeing as how I am only 26 and my credit history is only a couple years old…. and possibly that my mortgage is still at about 78-80% utilization. Anyway I guess the score is high enough that should I ever need credit I can probably secure it, but I’m kind of ticked that I’m not in the 900s…oh well. After a comment by Mister X – I realized that whatever I got from Transunion was useless. I thought it looked high, but I just assummed it was the new system implemented in the post I wrote about here about the new scoring system. 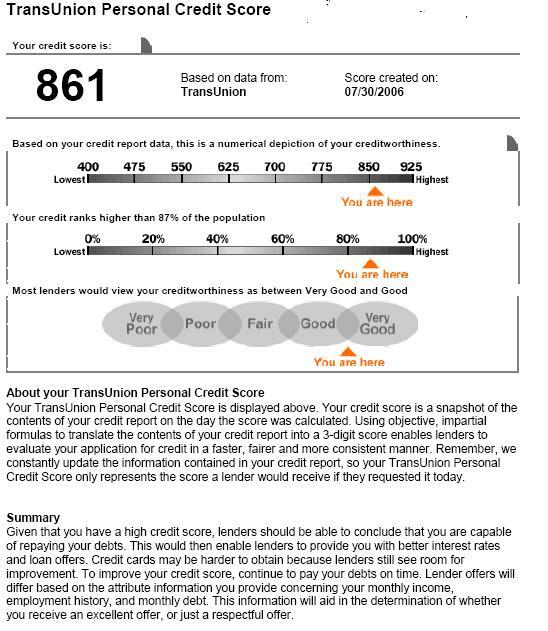 But that post says the range goes up to 990, I’ll have to do more research but anyway below is the score Transunion gave me.